None of these are affiliate links. I like Montessori Print Shop printables and thought it would be useful to have a link of all the MPS grammar products that correlate to Classical Conversations Cycle 2. When I couldn’t find a printable, I linked to other blogs and their corresponding Montessori grammar lesson. There were still many weeks for which I could not find Montessori activities for, but Half A Hundred Acre Wood has a blog post with many worksheets and other resources for every single week of Cycle 2. Week 1 Parts of Speech – Farm game (articles, noun, adjectives, verb, and adverbs) Here’s a post that explains the grammar farm. Week 15 Four Purposes of Sentences – I found a free sentence sort that would be Montessori-ish at Teachers Pay Teachers. Also this noun and verb activity ties week 16 to week 17. Week 21 Conjunction – not a printable, but a great Montessori lesson on conjunctions. Week 23 Adjective – Logical Adjective Cards, Detective Adjective Game, Command Cards for Detective Adjective Game. Week 24 Interjection – Grammar boxes for the elementary student includes interjections, as well as the other parts of speech. Grammar boxes are explained in this post. 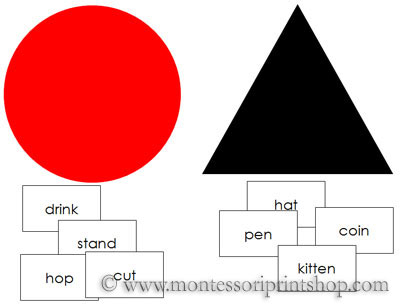 Montessori For Everyone has a blog post of games to play to teach the parts of speech.